THE University of the Highlands and Islands will be encouraging Belladrum-goers to wrestle with topical issues as sponsors of this year’s Verb Garden. The tent will feature a range of discussions, exclusive interviews and educational workshops. The programme includes a ‘wrestling: sport or entertainment?’ debate with colourful Scottish wrestlers, Grado and Jack Jester, a sports psychologist from Perth College UHI and local booking agent, Steve Robertson. The subject of using computer games in education will also be discussed. The ‘call of duty’ debate will feature learning experts from the University of the Highlands and Islands and Manchester Metropolitan University, the director of Elgin-based game development and publishing company, Hunted Cow Studios, and the winner of the 2015 Moray Game Jam competition. As well as debates, the University of the Highlands and Islands Verb Garden will also offer workshops and activities for people of all ages. 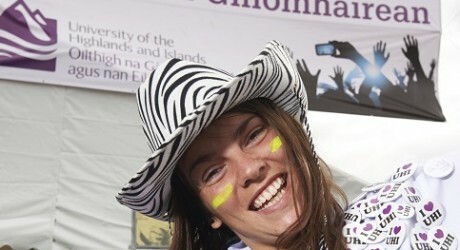 Scientists from the Scottish Association of Marine Science UHI will entertain kids with tales from the sea and will be recording a soundscape to show similarities between the experiences of festival-goers and marine animals too. University staff and students will also be showcasing their skills around the festival site. Science superheroes will run interactive pop-up experiments and Spiderman fans can marvel at tree climbing demos by representatives from Inverness College UHI’s Scottish School of Forestry. Student bands will open the Seedlings stage on both mornings of the festival. Flat Six, an alternative rock four-piece from Perth College UHI will kick off proceedings at 11am on Friday and Autumn Sun, an indie folk-rock act from North Highland College UHI’s Alness campus, will take to the stage at 11am on Saturday. Four of the university’s music students will also be undertaking placements, developing their skills as site assistants, press assistants and artist liaisons at the festival. Anyone who would like to find out more about the university at Belladrum can head to the University of the Highlands and Islands trailer to pick up a prospectus and speak to staff about the courses on offer. The trailer will be located next to the Verb Garden tent. The University of the Highlands and Islands principal and vice-chancellor, Professor Clive Mulholland, said: “We’re excited to be continuing our partnership with the Belladrum Tartan Heart festival. Festival organiser, Joe Gibbs, said: “We are really delighted to welcome the University of Highlands and Islands back to their sponsorship of the Verb Garden. Charlotte Bywalec, a HNC music business student from Perth, has been selected for the artist liaison placement at the festival. She said: “I am really excited and honoured to represent Perth College UHI. I feel this is will not only bring a new experience to me, but I will also be able to really understand what is it like to work in the music industry and in an environment where you are working with the artists and the festival to make the day successful. Check out too twitter.com/allEducationPR. Plus twitter.com/allFestivalsPR.